Many businesses have increased their efforts to encourage healthy lifestyles for their employees by offering employee wellness programs. 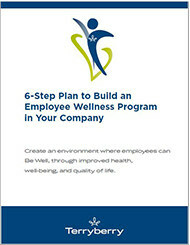 Terryberry’s new Whitepaper outlines a six-step plan to launch your employee wellness program successfully. Create an environment where employees can Be Well, through improved health, well-being, and quality of life.